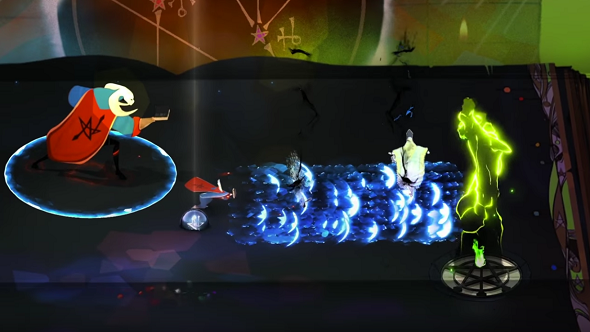 Supergiant’s next game, Pyre, retains the gorgeous hand-drawn visual style the studio has come to be known for, but it also has a multiplayer versus mode, which is a little bit different to say the least. You can check it out in the gameplay trailer above. Keep an eye on what’s releasing with our upcoming PC games list. Since you probably can’t tell what the hell is going on in the video, here’s the lowdown. In Pyre’s multiplayer you must lead a team of three Exiles, switching between them whenever you want, with the goal of extinguishing your opponent’s flame with an item called a celestial orb. You can sprint-dash or leap to bypass opponents, raise defensive shields that banish enemies on contact and even fire the shields off like projectiles. Celestial orbs can be carried or thrown. It sounds a bit like violent basketball. Different environments and character skills will make each match feel distinct, according to a post on the PlayStation Blog. Multiplayer could be local-only, however, as it all depends on whether online battling can be implemented to a sufficient standard before the 2017 release. Single-player takes priority.